With the explosion of marketing automation tools in recent years, its little wonder that welcome emails are becoming the norm when signing up for an online service. If you want to see the best welcome email examples, then read on. A welcome email is simply an email that gets sent (usually automatically) to any new users of an online service. 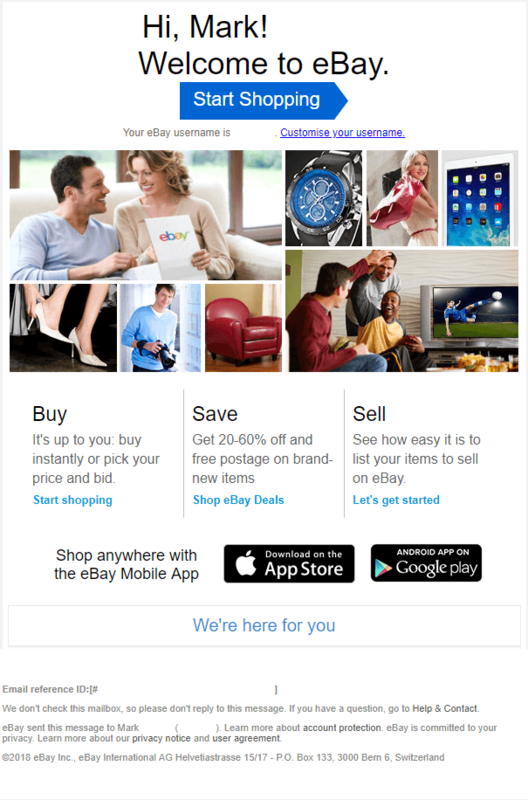 For example, when you sign up to eBay or Amazon, you will get a welcome email within a few minutes. Automated welcome emails have been used since around 2005, and have gained a lot of popularity since then. These days, it’s almost impossible to sign up for an online service without receiving some form of welcome email. Why Send a Welcome Email? Sending a welcome email to your new customers is a quick and easy way to show them you care. The most common use of welcome emails is to guide new customers through an onboarding process. Since onboarding can sometimes be an important step in your sales funnel, you want to make sure its always done right. The best way to get customers to complete onboarding is through a welcome email. The end goal of a welcome email is to give the new customer some benefit. You have to give them something. For example, give them access to the support email, or phone number. You could also give them a 20% discount on their next purchase. The options are limitless, just make sure you give them something. Some imagery – User engagement is proven to be higher when using images instead of text. Steps for onboarding (if required). Future discounts on products as a thank you gesture (if required). Ways to contact you if they need assistance. A way to unsubscribe from further emails. This is governed by the CAN-SPAM act. eBay hits the nail on the head! What do you think is the number one priority for eBay? It’s to get people shopping on their website. What clearer way to send a CTA (Call-To-Action) than to have a button saying “Start Shopping” at the beginning of your welcome email. Also, notice how they use your name in the email? This is a tactic using personalized marketing which can greatly increase email open and click rates. Notice the images all contain people smiling and appear to be happy with their newly acquired items? There are 3 distinct blurbs which tell you in 1 word what eBay is about. Buy, Save, Sell. It also gives you options to download their mobile apps. At the bottom, they say “We’re here for you”. This is one of the best welcome emails we have ever seen. Easy to read, short, and straight to the point. 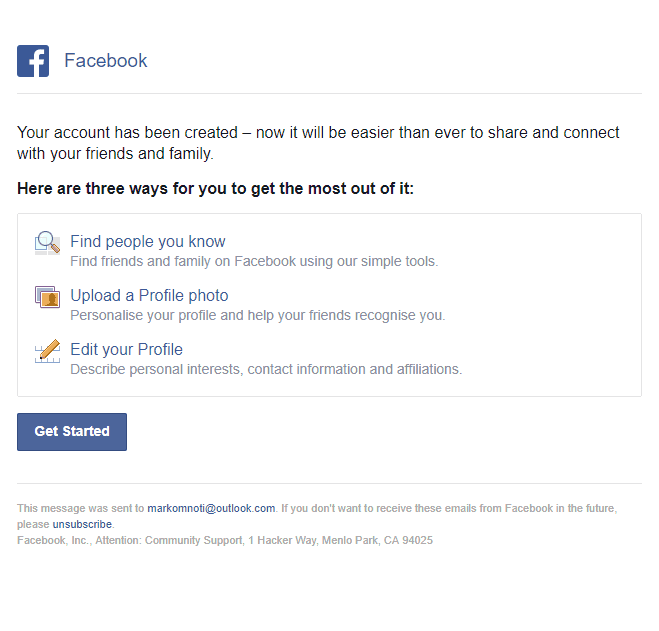 When signing up for Facebook, they take a slightly different approach to their welcome emails. There are minimal images, and they don’t seem to personalize the welcome email at all with the customer’s name. There is a quick spiel about easily connecting with friends and family, but not much else. They do have a very straightforward and easy to follow onboarding process which you can begin with the click of a button. A very good example by Target. Plenty of images targetted towards mothers with children. There is also an offer to sign up for their newsletter. At the bottom is a menu which goes directly to their website’s relevant section. The clicks from these welcome emails are usually monitored so they can tell exactly how many people click on the “Toys” menu item for example. Monitoring your clicks is a great way to find out who your customers are, and what they’re looking for. When you collect billing details upfront (like Netflix), there is no need to have a CTA or any other promotional material, as you have already won the customer! 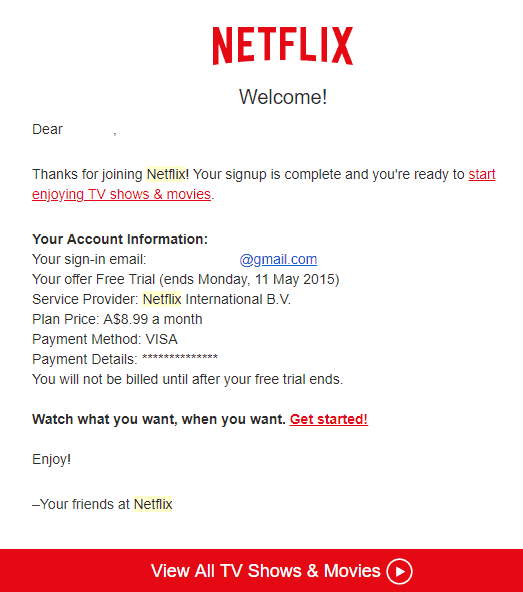 When you sign up to Netflix, you get a simple welcome message like this with a few billing details, which is useful for the customer. There are a few links that go directly to their page so you can start watching! You may want to consider this type of welcome email if you collect billing details upfront. A great (but somewhat long) example by Zapier here. They have a CTA button at the very top prompting you to build your first workflow. They then explain how you can make the most out of your trial by giving you some tips. Another CTA at the bottom for good measure and a thank you for signing up. They also added some quirkiness to it by having the love heart symbol at the bottom, which we think is actually a really good way to mellow the tone of the email at the end. An interesting example from Hootsuite. There is an optimal amount of images and text which is great, but not many people know what the word “cinch” means, which brings us to an important point. Only use simple and easy to read words in your text. Using complicated words can mean the customer is spending more time trying to figure out the meaning, rather than taking in what you said in the email. A CTA button right in the middle and links to download the app to your phone makes things easy for the customer. Being Salesforce, you would think they know how to do marketing right? Well, they do! Check out this beautifully crafted and inspiring example of a welcome email. It has tons of imagery and a good amount of text. It directs the user to the login page so they can begin trialing the product straight away. It also gives them a support phone number where they can get help if needed. Stright up, they have a beautiful image of beach shacks, and it makes you wish you were there. They’ve also personalized the email by putting your name at the top. There is a CTA button in the middle to view their #1 hotel. If you aren’t interested in hotels, no problems, check out the other links below for restaurants, tours, flights, rentals, and to download the app. This is how a welcome email should look! Well done, TripAdvisor. It’s easy to see why Groupon got this right. Not only does the welcome email look inviting, but it gives you plenty of reasons to shop with Groupon. They establish trust with the shopper with the 4 points above the Shop Now button. There are plenty of images of happy people in this one, enjoying things they purchased. Notice the shopping websites always have people smiling in the pictures? When looking at the AirBnB welcome email, you can instantly see they have used a very image intensive email. They explain the many ways AirBnB can be used for traveling. This can sometimes get a bit confusing if you want a clear-cut action from the end user, however its a good option as an informational email.